Engineers from the Jet Propulsion Laboratory (JPL) NASA developed and tested several prototype devices designed to study ice on the surface of other celestial bodies. This is reported on the NASA website. The surface of some celestial bodies can be partially or completely covered with ice. For the sampling of ice and drilling, traditional tools designed for hard rocks are not well suited, so NASA engineers develop prototypes of various instruments adapted for ice. It is expected that in the future such tools can help in the study of Titan, Europe, and Enceladus. As a tool for drilling deep wells, JPL engineers propose using an ice probe with a circular saw and a plutonium heat source. 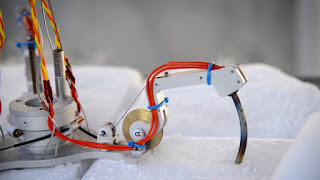 The blade of the saw will slowly turn, dyeing ice and throwing ice crumb into the probe body, and the heat source will melt the incoming ice and pump it out. Such a probe, according to the developers, will be able to dive into the ice for several kilometers, and samples with melted liquid and liquid from under the ice will be sent to the surface using a pneumatic capsule delivery system. To collect samples on surfaces that are far from the descent vehicle, the JPL offers two possible solutions: use folding manipulators up to 10 meters long or, if necessary, take a sample from a longer distance, shoot a special attached projectile that can fly up to a distance of 50 meters . The material is directly taken from the surface by means of a claw prototype with heated elements, which are immersed in the ice and provide a firm fixation of the drill. At the moment, the prototypes developed have passed only the first tests. In the future, NASA will consider their effectiveness and decide whether further development and testing is required. With a positive decision, it is possible that technologies based on developed prototypes can be used in future research missions of the agency on the surface of other celestial planets. Enceladus is one of the most interesting "ice worlds" to explore. 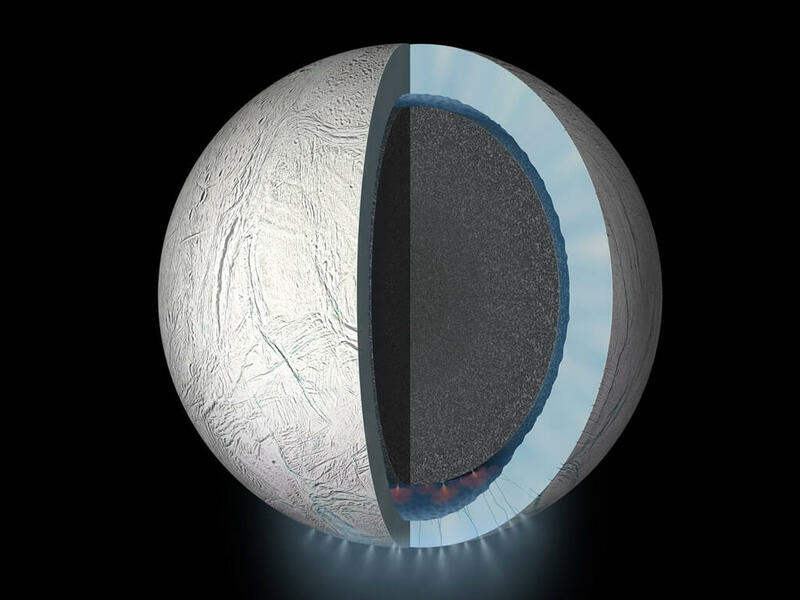 The fact is that according to the latest data, the ice layer is relatively thin - with the help of information collected by the Cassini probe, scientists have determined that in some areas the thickness of the ice can be about two kilometers. Under the ice the ocean of Enceladus is liquid and relatively warm - and, therefore, there are key ingredients for the emergence of primitive life forms. The heating of the ocean, according to the models, is due to the tidal forces of Saturn.